Does anyone else have this? The copy in the database has a gold foil #1 (as does every image I found online). Meanwhile the copy I just received directly from NEC is clearly a blue foil #1. I'm trying to figure out if there is some level of consistent variation (lower serial numbered ones are blue) or if it's random or a one-off. Anyone else have this? What color foil? What serial number? I'm sure that quote's in one of our member's sigs. Yep. I was right. It's padreglcc's tag. See Padre, people are listening! And here I was hoping for some Tick insight. Best I could get from NEC was a statement that Bob Polio (founder/publisher) says "the blue foil cover is the rarer of the two." I wish I could have gotten some specifics but we are talking something basically self-published during their heyday so keeping details in their heads 20 years later is a stretch. I have ordered two more just to see what I get and still hope to find more on my own. I do plan to add the blue one in as a variant. The #2 reprise has a variant color of red instead of silver foil. Red being the rarer color. I have been buying Tick comics since 1988. I'm always happy to meet a fellow Tick comic collector. 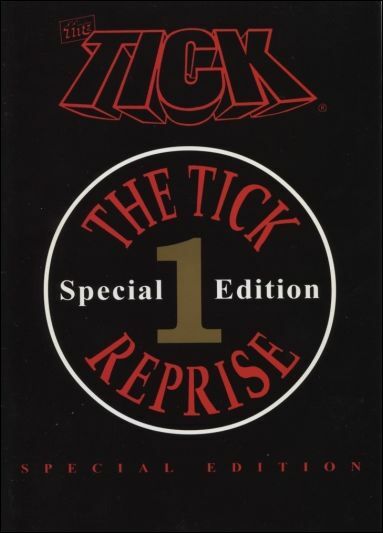 I have a pretty extensive collection of Tick comics so if I can be of any assistance let me know. If I don't know the answer I can try to find out. I sometimes have luck communicating with NEC. (but not always). Since that post 4 years ago, I dove pretty deep into Tick books. I didn't know about the red foil #2. Going to have to see about tracking that one down now too. I'm still working my way through the various variants of the original series, a small number (3) of the regular issues, and a handful of other variants. Even trying to get more of the collections now too. I was fascinated to find out the Bonanza collections were just the original issues bound together. It's a great series of books to collect.